AnonD-55878, 22 May 2012I bought this mobile last week yesterday I dropped it down after that touch is not working ... moreu r finished dude.. go buy a new one..
Hi... I hav a samsung s3500 slide phone... It display often goes white.. I went to repair it and they said that dnt buy any slide phone... Bcoz its display always goes white.. So i thought to buy this xpera mini pro phone... Is there the same problem with the slide??? diana luffy, 01 Jun 2012Hi all, can someone tell me what need to download in android market :-/ All You have to do is to scroll to the desired application, press download and then apply. well! it's an awesome phone to have . this phone is great but only a few issues like poor battery, poor ram utilisation because of the poor O.S and very low internal memory.also to mention useless trials preinstalled.otherwise its a great phone.not sure if it is future proof.but lucky it wil upgrade up to Icecream sandwich.what bout jelly bean?wil it make it as far as that?food for thought. my SE xperia mini pro purchased one month ago has started hanging from day two. Phone can be restarted only after battery is removed and reinstalled. does any buyer has faced such problem and if yes, what was the solution ? Does Skype, WhatsApp and MessengerWithU applications from the Android Market.? If they do can I make video call with the both cameras on Skype.? 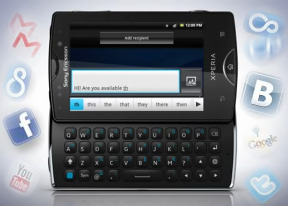 can anyone tell me current prices of xperia mini, mini pro and live ? is it good to buy se phones after breakup of sony and erricson?